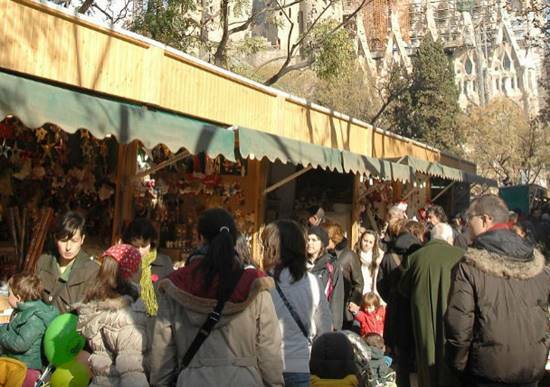 The Christmas Market at the Sagrada Familia is held opposite to the Sagrada Familia church since the 60s. Nearly a hundred stalls sell all kinds of figures and elements for cribs, Christmas trees and plants, gifts and food products and candies. No shortage of course of churros stalls and you will find also chestnuts and sweet potatoes stalls. This Christmas fair coincides with that of Santa Llúcia, which is celebrated in front of the Cathedral of Barcelona. And this is not a casual event, because the Sagrada Familia fair was created when there was no more space for stalls in Santa Llúcia, and several artisans decided to install them next to Gaudí's masterpiece.